Ostrich is a great meat that has the flavor and texture of beef without the fat. Ostrich is very lean and if you are cutting back on fat, this is a meat to use. Combine red wine, olive oil, sliced onion, garlic, bay leaves, Worcestershire sauce, parsley, rosemary, pepper, thyme and Tabasco in a large glass, shallow baking dish. 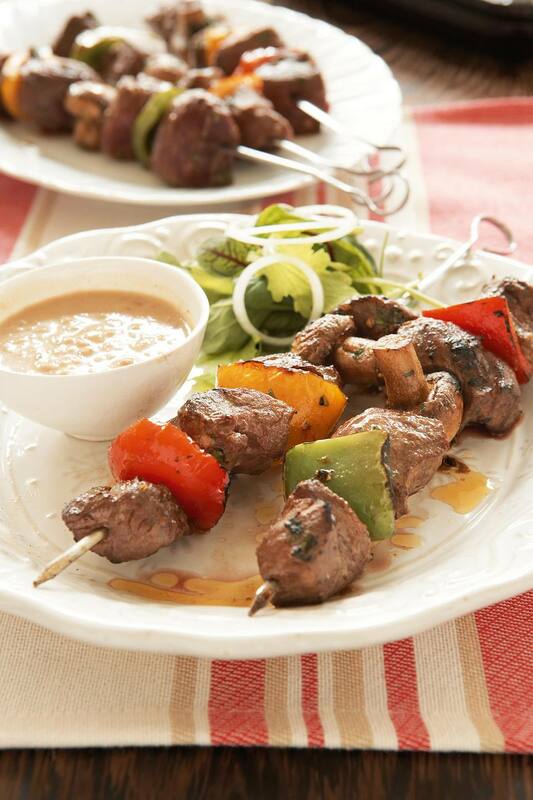 Thread ostrich cubes, bell peppers and yellow onion onto skewers, intermixing the pieces as you go. Place in baking dish with marinade and turn to coat evenly. Cover and refrigerate for up to 24 hours. The longer you marinate the more the marinade will flavor the meat. Preheat grill. Remove skewers from marinade and place on hot grill. Discard marinade. Grill for about 2 minutes on each of the four side, or until done ( they must reach an internal temperature of 165 degrees F.). Once cooked, remove from grill and serve.